When you’re in for a new travel tripod, it is not an easy task: the market is just too big and there are so many to chose from. Well-known companies like Gitzo, Dolica or MeFoto have a specialized lineup of lightweight and durable tripods that are specifically made for travelers. One tripod that I was able to take on a test accompanied me on my trip to Peru: Manfrotto’s BeFree. As I want to pass on my experience with it, I wrote the following Manfrotto BeFree test! Manfrotto’s BeFree basically is a travel tripod designed to be taken on worldwide trips. Its size and weight is optimized to fit into most luggage bins in e.g. planes. At the same time the BeFree is very durable and sturdy to withstand everything that you might come across. This tripod is made in Europe (Italy) like it’s UK counterparts, the 3LT Eddie and 3LT Brian. Manfrotto’s s BeFree is a tripod made of either aluminum (reviewed here) or carbon fiber (a little bit more expensive). It is made in Italy and weighs 5.30 lb while being able to carry photo gear up to 8.80 lb. The included ball head allows a quick release and leaves a very sturdy impression. It held my EOS 70D with all lenses quite well – if you want something sturdier you can easily replace it with all ball heads that have a 3/8″ stud. Overall, the tripod came across as very well-made without anything lose or rattling while using it – good job so far! With a length of 15.80″ it will fold together to fit into most backpacks or camera bags. The leg angle selectors were a nice addition during our Manfrotto BeFree test: you can quickly switch between two different set angles for your camera positioning. If you need to adjust the tension of the leg locks an included hexagon key allows you to do that on-the-fly. The only thing I would recommend though is using an extra weight during windy conditions: this is needed to remove any vibration caused by mother nature. With a weight of 5.30 lb Manfrotto's BeFree is on the heavier side of the travel tripods compared on this site. It's still a good value though - if you need it to be more lightweight, check out the carbon fiber version. 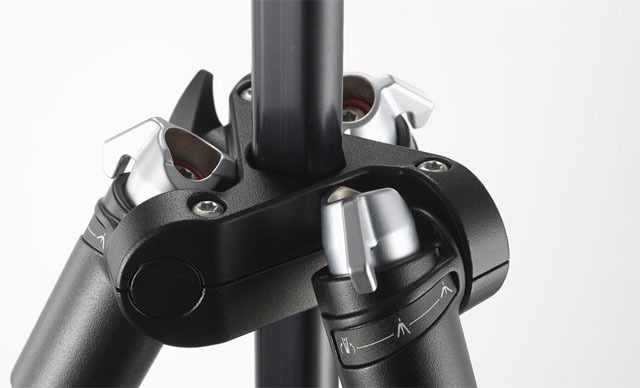 With a folded size of 15.80" the Manfrotto BeFree comes in the middle level of the tripods presented on this page. Compared with e.g. the 3LT Eddie 13.40" as the lowest operating height is a mediocre result. The maximum operating height of 56.70" is a good result though. A supported load of 8.80 lb is also a result that places the Manfrotto BeFree in the middle level of the travel tripods presented here. As a conclusion of this Manfrotto BeFree test we can recommend this little travel tripod because of its build quality and design. It never let us down on our trips and performed quite well throughout the globe. You will have to state though that there are some options out there like the Sirui T-025X or 3LT’s Eddie that are more lightweight and can carry heavier gear. Nice: a great overall build quality and attention to detail!